We’ve already awarded our Best Bartender, but the honors just keep coming. Here’s what’s top shelf in Vegas Seven senior editor Xania Woodman’s book. The coolest thing to come to this hot, dry city is the JetChill (JetChill.com), a back bar device no larger than a blender that spits out highly compressed pucks of food-grade carbon dioxide-based dry ice. 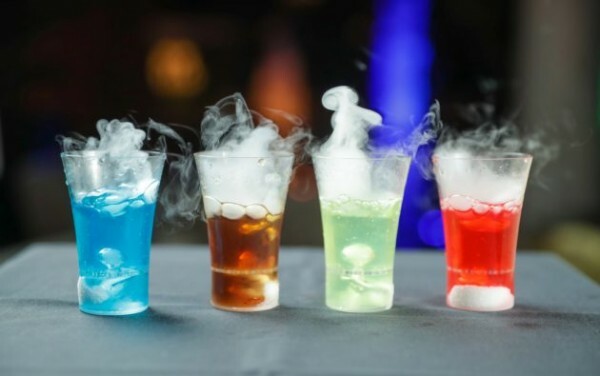 See them in action at Intrigue in Wynn, where the weekly shot special is always a smoking-good choice. Who would have thought that when a handful of bartenders launched a tongue-in-cheek independent cocktail competition, nine months later it would be a full-blown movement? The Underground Bar Brawl Club has risen to legitimacy through its monthly for-bartenders-by-bartenders series. Find, then follow them, on Facebook, or hit the next event July 31 at Pub 365 in Tuscany Suites. Menus are becoming increasingly complicated—some pander to brands; others overload you with information; iPad menus cause screen fatigue. Which is why the menu Aria’s director of spirits, wine and beer, Craig Schoettler, dropped in June at Sage (Aria.com/Sage) is such a revelation. The crosshairs design allows you to pick your poison based on where it charts on the basis of sweet to dry and refreshing to bold. On the flip side, there is a time and a place for having fun with menus. The new zine-format menu at Velveteen Rabbit (VelveteenRabbitLV.com) speaks to our twin loves of liquor and literati. Like it that much? Take it home for $1. Plus, it gives solo imbibers something to look at other than their phones. Some may recall when Nectaly Mendoza was glued to Herbs & Rye 24/7, nursing it like a newborn with nary a thought about competitions or travel. Fast forward to 2016 when the guy is still on a whirlwind tour that began June 5 and has included judging a competition in Seoul, bar takeovers in Paris and L.A., Cane Camp in Puerto Rico and a pop-up bar in St. Louis. The fun continues this week at Tales of the Cocktail in New Orleans, where Mendoza and his team are finalists for the Spirited Award for Best American High Volume Cocktail Bar. Upbeat and unstuffy are things we like in our neighborhood bar. We also like cold beer, simple cocktails and shopping for kitsch. All of the above are on offer at Derek Stonebarger’s Rebar on Main Street (Facebook.com/RebarLV). A portion of proceeds from the current cocktail lineup benefits Veterans Village, the Huntridge Foundation and After-School All-Stars. And no matter how hard we try, we can’t get mad at $3 classic cans (think Hamm’s, Olympia and PBR) and $5 premium cans (we swear by Big Dog’s Red Hydrant and Joseph James Citra Rye). Welcome, to the ’hood, Rebar! The post The Mixology Awards 2016 appeared first on Vegas Seven.